Something very special about hummingbirds makes them most endearing to us. Perhaps it’s their tiny size, lightening fast antics, or the sheer distance of their migration which we find so fascinating? Their behavior is just cute, even when it come to their territorial displays, which can sometimes be maddening! They say patience is a virtue, and it is with patience you can train hummingbirds to feed by hand. 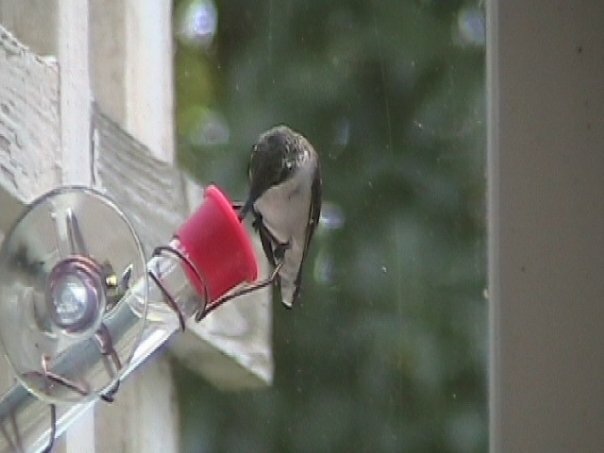 This set of small feeders consists of a window hummingbird feeder and a staked feeder for potted plants. Once hummingbirds become familiar with these feeders, the stakes, or bases, are meant to be hand-held. Sitting very quiet and still, while holding this window hummingbird feeder will entice the tiny sprites to drink from them while you’re holding the feeder in your hand! The set is complete with two extra feeding tubes and caps. One Feeder is meant to be placed directly on the window, while the other is upright and staked. Copper stems are sturdy but adjustable. A great hobby to try this or next hummingbird season. Patience is the key… because “if you build it – they will come”! All bird feeders are not created equal! Many of the standards are made to hold one kind of food. Thistle feeders for example, are only functional with thistle or nyjer seed. Hopper type feeders work with several kinds of seed mixes, or black oil sunflower, but not with peanuts, fruit, or suet. And suet feeders won’t hold seed, no matter how large the morsels may be in size. Some peanut bird feeders however, will accommodate other treats to further entice feathered friends. 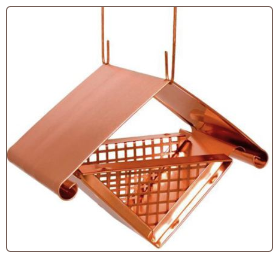 This solid copper peanut bird feeder is hand crafted with superb quality. The architectural design is pleasing to the eye with it’s clean lines and modern form. The copper will turn to a lovely patina finish over time. But the real beauty in peanut bird feeders like this is versatility. Offering shelled or whole peanuts in cold weather for your local resident birds, food may be changed with seasons to attract migratory birds as well. Fruit works well with this design, as does suet and nugget-type treats. That’s like having three or four bird feeders in one! Also being hand crafted in the USA, you know you’ll be supporting local artists and our economy. So, for the next wild bird feeder, you may want to keep in mind the versatility factor and buying USA made art. Nesting Eastern Bluebirds video spotted on YouTube provides fantastic video and wonderful still shots that capture any birder’s heart. This camera lets us view male and female blues at a Gilbertson Nest Box. Bird Cams capture a secret window into the world of nature that only few are lucky enough to experience. Having been on the market for several years now, bird cams, or bird watching cameras, have really come down in price making them more affordable than ever. The technology and ease of use has also improved, making bird cams more user-friendly and accessible for everyone. Sometimes a forgotten project, birdhouse kits are the perfect choice for school kids, youth groups, and families too. What better way to teach the importance of conservation and stewardship to the next generation? So many great lessons can be tied into birdhouse kit projects! Innovative, fun to assemble, and totally functional, these wood birdhouse kits provide real nesting sites for wild birds. In the off-season, they make for perfect roosting spots too. Real estate is tough out there, and competition for nest sights is increasing as habitat continues to shrink. Non-native birds like House Sparrows and Starlings are to blame for much of this competition with our native song birds. 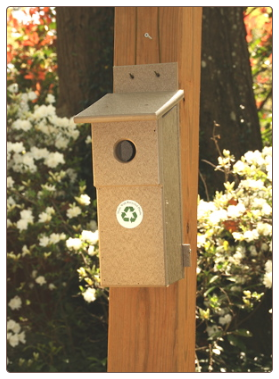 The “Box for Birds” comes in three great designs; traditional (shown here), Modern, which is a copy of the famous Frank Lloyd Wright House, and a church design too. They require no tools, or glue, and come with puzzle-like assembly instructions. The gist is sliding pieces of sturdy birch plywood that fit together in a snap! 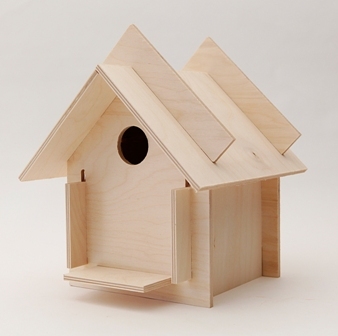 These substantial birdhouse kits may be painted, stained, or left natural. A fun project for kids and adults alike! SAN JOSE, CA – More than 100,000 people have joined a campaign calling on eBay, the world’s leading e-commerce company, to shut down its live animal listings and take a stand against puppy mills. The San Jose, California-based eBay corporation is under fire from animal advocates upset by the sale of ‘puppy mill dogs’ on eBay Classifieds. Puppy mills are commercial breeders who mass-produce animals under inhumane conditions, resulting in heath and behavior problems that buyers often don’t discover until after they’ve taken their new pet home. eBay does not allow animal listings on the company’s auction site, but such listings are still allowed and promoted on eBay Classifieds. Six months ago, Felissa Elfenbein of the Two Little Cavaliers blog urged animal lovers to contact the company, leading to a grassroots campaign on Change.org asking eBay to stop selling live animals on all of its sites. Half a year later more than 100,000 people have joined the petition drive. Animal activists argue that it’s impossible for eBay to monitor the health or welfare of animals listed on its site, and believe the only way for the company to stop supporting animal cruelty is by shutting down its pet listings or expanding its partnership with Petfinder.com to allow adoption listings only. The Change.org petition calls on eBay Classifieds to end its live animal listings out of concern that the site is providing a marketplace for puppy mills and unethical breeders to deceive consumers. Internet anonymity, like that provided by eBay, makes it difficult to hold the people responsible for these abuses accountable. Although eBay Classifieds’ policy does not allow breeders with “a history of non-compliance inspections with the USDA” to list on their site, there is a loophole in federal law that allows kennels selling directly to consumers via online or classified ads to bypass USDA oversight. As a result, conscientious consumers are misled into believing that sellers on eBay Classifieds have been subject to inspections to ensure that their animals are treated humanely. Several years ago, eBay considered the creation of a live animals auction category. Following protests from animal activists against allowing unscrupulous breeders on the site, eBay decided to maintain its policy against live animal listings. eBay Classifieds gives those same unethical breeders a marketplace. Change.org is the world’s fastest-growing platform for social change — growing by more than 400,000 new members a month, and empowering millions of people to start, join, and win campaigns for social change in their community, city and country. Although some folks absolutely despise them, others derive great enjoyment from feeding squirrels. Each side must think the other is nuts… no pun intended. If bird feeders are properly protected, you can feed the squirrels while keeping them out of birdseed effectively and permanently. Bird Feeder placement and baffles are the absolute answer. Even if you don’t have squirrel feeders, but do have pesky squirrels, baffles are still your answer! Fun squirrel feeders like the traditional table and chair feeder shown here have now gone recycled. Poly lumber, or recycled plastic is guaranteed to never crack, split or fade. The quality is superb, making this one squirrel feeder that will last a lifetime. 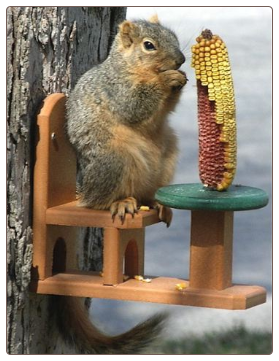 And speaking of long-lasting, have you ever tried the squirrel logs instead of corn on the cob? They’re super cool because one Sweet Corn Log is equal to about twelve ears of dried corn. They’re actually compressed corn that’s easy to handle and feed. Less filling and more watching is always a good thing! Our guys love them, but you must be sure they are securely attached as our crafty critters have managed to steal them once in a while! 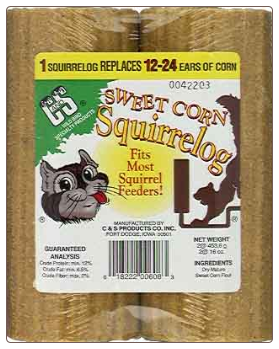 Available in Sweet Corn, and Corn and Nut Flavors, the squirrel logs are definitely a must for your squirrel feeders. Wow… if you think male bluebirds are vibrant blue – check out this little guy! An Indigo Bunting in brilliant cerulean blue was spotted a few days ago at my finch bird feeder. More common in Florida, it’s rare for them to make an appearance in my North Georgia yard. Once, and only once, a Painted Bunting also made a visit to the same finch feeder. Lucky are the folks who see these gorgeous birds on a daily basis! And fast? 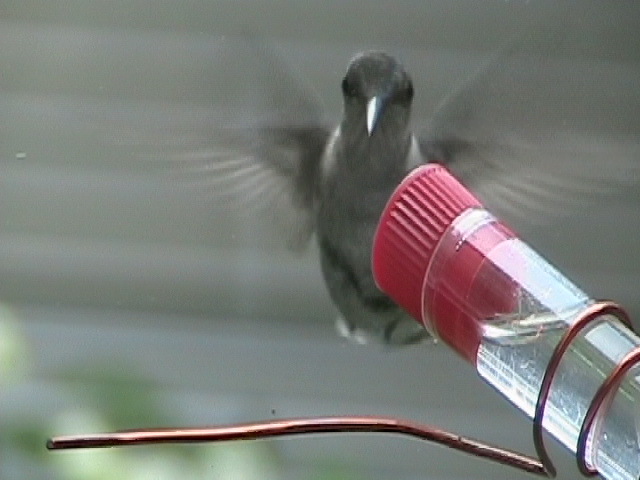 They almost as quick as hummingbirds, it was difficult to get a good look at him. Possibly the leaf misters were attractive, or he’d seen all the other bird activity going on? For two or three days now, he’s been spotted at the same feeder. More than just Goldfinches are attracted to a Finch Bird Feeder. This protective feeder sees many Chipping Sparrows in winter, as well as Chickadees, and House Finches. 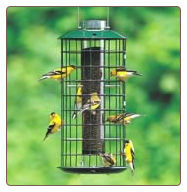 Just because a bird feeder may be labeled for a specific species, it will always attract more than just that bird. Finch mix is a great staple to offer feathered friends throughout the year. nesting materials that could pose hazards? Luckily for the robins, they did make it to a caring vet who performed the surgery to separate them pro bono. Turns out genetics were not the culprit, but a small piece of plastic thread in their nesting materials. After they hatched, it had caused there skin and wings to fuse to it, thus developing together. The prognosis for the larger bird is good and he will be released back into the wild. For the smaller robin, his life may be lived out permanently at the rehab center if he survives. His wing needed to be clipped in order to separate the two birds. Our discards are killing wildlife… especially birds. Fishing line and similar materials pose a life threatening hazard to all wildlife and in particular wild birds. Sadly but surely we kill the planet that sustains us all. Using recycled materials greatly helps the environment by reducing waste and keeping said materials out of landfills. It takes about 25 to 40 plastic milk jugs to produce a recycled bird house or feeder. These blue bird houses are NABS approved, (North American Bluebird Society) and create the perfect nesting site for Eastern Bluebirds. With such a large shortage of natural nesting cavities, why would a great nest site like this be vacant? Several factors will deem successful habitat for birds, and pesticides are detrimental in successful clutches. Environment plays the biggest role in attracting birds, and while everything may be super green and manicured in your yard, it may not be good for your avian friends. Ingested through insects fed by adults, pesticides wreak havoc on developing nestlings. Although sometimes not harmful to the adults, they are deadly to nestlings. If clutches in an area repeatedly fail, the bluebirds are likely to abandon the spot and seek other habitat. Predators will also discourage nesting. Roaming cats, raccoons, snakes and larger bully birds will drive bluebirds from a possible nest site. House Sparrows and Starlings (both non-native species) will kill adult bluebirds in the nest box, as well as nestlings, and even destroy eggs too. Unfortunately this is common practice. These invasive and destructive birds are likely the main cause for the bluebird’s demise in the 70’s and 80’s. Ever-shrinking natural habitat with fierce competition for available nest sites being the reason. •Be sure that blue bird houses are erected in proper habitat. Open spaces are preferred, with perching spots for hunting insects. •Predator guards on bluebird houses also increase chances of successful fledging. •Keep roaming cats indoors, or ask your neighbor to keep their cat out of your yard. •Fresh water will entice bluebirds and others. •Remove old nests (away from the area) after birds have fledged. A blue bird house with an old nest will not be used by another pair of bluebirds seeking a nest box. •Supplemental feeding (with live mealworms) helps parents raise their young. You can attract more birds to your place with less effort. 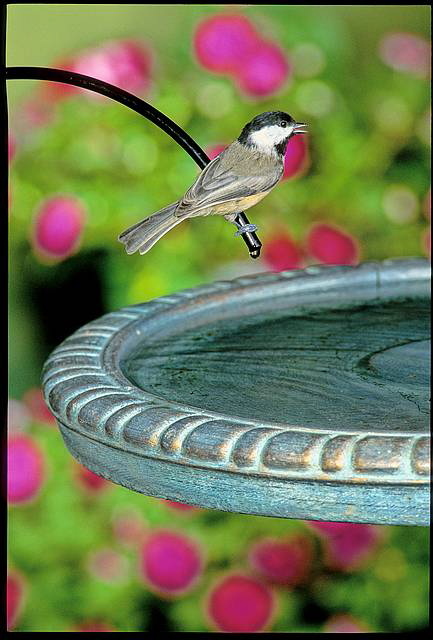 No need for more feeders or birdhouses because a birdbath will really do the trick! Fresh water in a birdbath is absolutely the best way to entice more feathered friends… and moving water is even better. Ripples made by a birdbath dripper or water wiggler are a visual magnet to wild birds, especially in summer’s soaring temperatures. 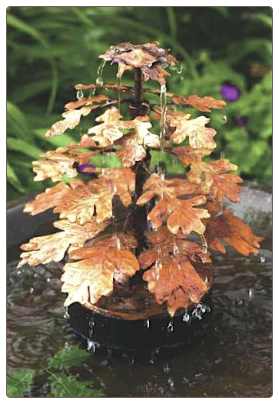 Birdbath fountains, like this copper one, also provide humans a soothing site and sound. Birdbath accessories like these are complete with simple installations-via batteries, electric, and solar models. When placing a water feature in your birdbath that requires electricity, the cord may be hidden using river rock, or other larger stones. These also give birds a safe and excellent perching spot on which to land. Great solar features are available, as they’ve improved dramatically over the past few years. This solar layered rock waterfall adds an interesting visual for both birds and their hosts alike. The soothing sounds of a small waterfall are found quite relaxing, while being greatly admired by avian amigos too! Hummingbirds adore birdbath fountains and bubblers (and leaf misters too) and can be seen playing and bathing in them daily if already hanging around your yard. Another great thing about moving water in a birdbath, is that mosquitoes can not lay eggs. Water is never stagnant, so it stays fresher longer. The optimal depth for birds to bathe and wade comfortably is about two inches. If your birdbath is much deeper, simply place a large rock in the center that sits above the water level for birds to perch. Multiple rocks or large stones always create terrific perching spots that birds find very inviting. Consider adding moving water to your birdbath, then sit back and enjoy the show!